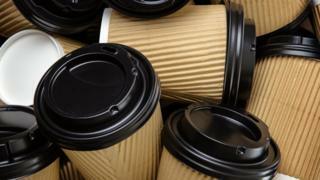 The Scottish government is banning single-use coffee cups in its main buildings in a bid to cut plastic pollution. From 4 June, hot drinks will only be served in reusable mugs. It is hoped the move will prevent 450,000 cups from being thrown away every year. Staff were informed of the changes and the alternatives from the beginning of May to give them time to prepare for the change. The ban will apply to all hot drinks purchased in St Andrew's House, Saughton House, Victoria Quay, Atlantic Quay, Marine Lab and Buchanan House restaurants and cafes. Drinks will be served in reusable ceramic mugs for those sitting in and staff are being encouraged to bring their own cups for takeaways. Environment Secretary Roseanna Cunningham said: "The Scottish government is determined to lead by example when it comes to tackling the scourge of plastic littering our countryside and polluting our seas. "By removing single use coffee cups from our main buildings, we will prevent 450,000 cups from being thrown away every year. "That's enough cups to cover the distance between Edinburgh and Dundee. "We support the EU's vision to reduce single use plastics as far as possible and ensure any single use plastics are easily recyclable by 2030. "We are currently considering what other single-use items can be reduced and removed from Scottish government buildings later this year. "Our newly appointed expert panel is considering what further action we can take to fight against our throwaway culture, and this will include looking at disposable cups and plastic straws and considering any potential implications for disabled people." The panel is made up of experts from retail, waste and chemical industries, the public sector and academics. Electoral Commissioner Dame Sue Bruce is chair of the Expert Panel on Environmental Charges and Other Measures. In February this year, the Scottish Parliament stopped using plastic drinking straws in its own cafes, bar and canteen, having previously used about 4,000 plastic straws each year. Last month, Ms Cunningham invited environment ministers throughout the UK to come up with a coordinated bottle return scheme. And in January, the Scottish government announced plans to outlaw the sale and manufacture of plastic-stemmed cotton buds following concern about the number of buds being washed up on beaches after being flushed down toilets. The Scottish Liberal Democrats meanwhile have been campaigning for a Scotland-wide levy on single-use cups, saying they could be "sent packing just like plastic bags were".